Someone used my garbage bin at work today. Not my disposable cup. My candy wrappers, though. I have to confess to feeling slightly violated when I saw someone else’s disposable cup left in my trash. Let me explain. In my small cubicle, to reach the garbage, you actually have to walk inside and kind of look around a bit. Then you see it, half-hidden away between my paper-shred box and boxes of stuff that haven’t been disturbed in the three and a half years I’ve been with my current employer, left by some previous tenants of my windowless box (and which I am afraid to investigate due to the likely presence of lethal dust bunnies or, worse, spiders or other vermin). Suffice it to say that use of my garbage bin entails more than just a stroll past my cube and a casual flick of the wrist. Maybe I’m bothered because my employer’s janitorial services do not extend to the emptying of employees’ trash bins. We empty them ourselves. This was quite a surprise to me, coming from the high-stress industry of banking, where the janitorial service emptied our trash regularly. I remember they even once or twice threw out a plastic bottle I had left on my desk planning to reuse. When I started working at my current employer, I may have even had to ask someone why no one was emptying my trash bin. So by using my trash bin at work, instead of one of the communal ones the janitorial staff actually does deal with, or even better, his or her own garbage bin, this Garbage Bandit of mine effectively contrives to avoid having to take out his or her own trash. Happily, it would appear that nothing else in the (I assure you, very organized) chaos of paper piles and stacked-up sticky notes occupying the majority of my desk surface was disturbed. But still. Maybe I have an introvert’s characteristic horror of too much being discoverable about me through my trash. Maybe other introverts will agree with me, that use of someone else’s trash bin (when there are several communal trash bins within an easy distance of my desk) constitutes a violation of workplace etiquette. Or maybe it isn’t because I’m an introvert that I feel this way, but rather because I’ve watched too much television where going through someone’s trash is a relatively common occurrence. Most likely, I harbor a secret shame about the quantity of candy wrappers that accrue in a typical workweek. You’ll note the absence of disposable cups, unless the Garbage Bandit strikes again. This entry was posted in Stories and tagged introverts, somewhat funny stories, workplace etiquette on September 26, 2012 by ms.grammarian. Back when I was working in an office, we had more of a “family” arrangement with “open walls.” While it was nice to see out the windows surrounding our building, we still sat fairly close to our co-workers and we each had our own trash bins. 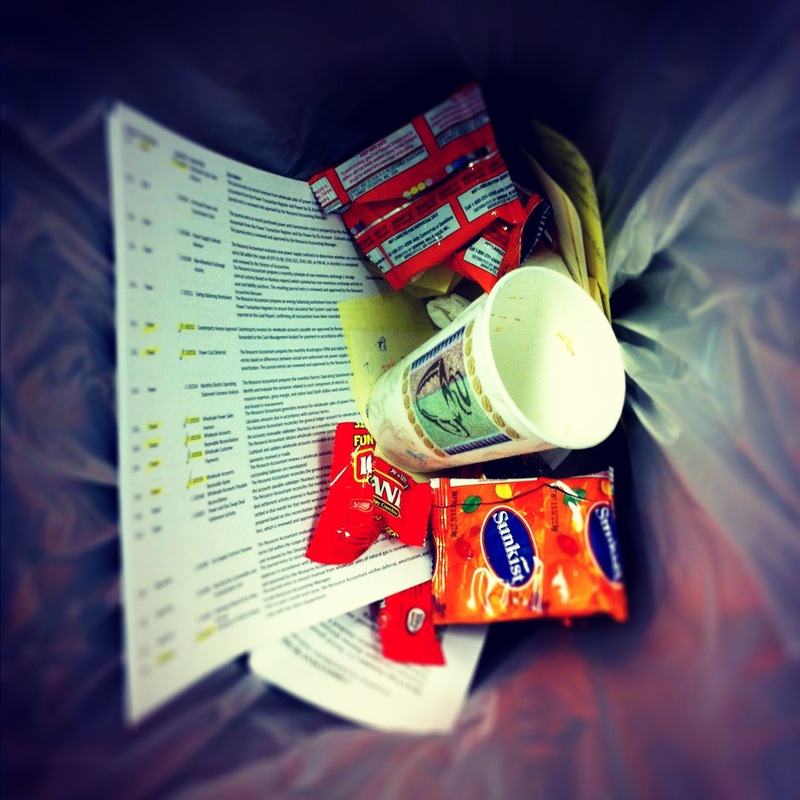 While chit chatting at another’s desk, one might causally toss something into their trash bin. When a banana peel went into mine on more than one occasion, I had to confront the person. I do not tolerate the smell of rotting banana peel next to my computer. Bananas are the worst! I’ve been known to empty other people’s garbage for that!